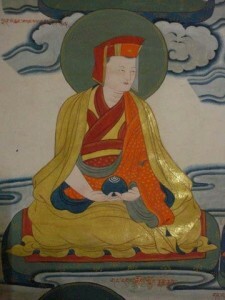 The Seventh Zurmang Gharwang tulku was known as Choschung Namgyal. Throughout the entire period of her pregnancy, the mother-to-be heard the unceasing echoes of a conch hailing the imminent arrival of a great being. In the Tibetan tradition, the sound of a conch also symbolizes the flourishing of dharma, and the manifestations of myriad Buddha activities. Many auspicious omens were present at his birth. Much to the astonishment of his mother, the remarkable child was born with his hands in mudra, as if he was supplicating to the wisdom deities. No sooner had he emerged from his mother’s womb, than the child sat in the Vajra position and spoke as eloquently as an adult, while thunderbolts roared in the sky. Coincidentally, His Holiness, the Gyalwa Karmapa was passing through the region and the anxious parents took the opportunity to consult His Holiness concerning the rather irregular behavior of their son. They were given many protective cords and in turn, told to redirect their inquiry to Chetsang Tulku who was temporarily in charge of Zurmang, in the absence of their Supreme Abbot. A year later, when the child was presented to the two tulkus of Zurmang, namely the Venerable Chetsang and Lopon Dorje – with impeccable composure, the young Tulku summoned his servant to fetch a damaru, and further astounded his visitors with a faultless performance of the entire Zurmang Cakrasamvara Dance. It was through this remarkable demonstration, he proved beyond all doubt that he was indeed, the omniscient tulku of Zurmang Gharwang. The Seventh Gharwang entered mahaparinirvana at the age of fifty three. At the time of his passing, countless rainbows hung over the sky of Zurmang. During the time of his cremation, the funeral pyre lit itself spontaneously, and many ringsel were recovered from the ashes.